If you’re up to it, join hundreds of like-minded people Thanksgiving, on Thursday, Nov. 22, in the Fourth Annual United Way of Central Arkansas Turkey Trot 5K and the new Gobble Wobble 1 mile run for kids up to 10 years of age. These races raise money for the United Way of Central Arkansas funded partner programs. Packet pick up for early registrants will be 10 a.m. to 6:30 p.m. Monday, Nov. 19, Tuesday, Nov. 20, and Wednesday, Nov. 21, at the UWCA Office, 1110 Oak St.
Late registration is Thursday Nov. 22. The Turkey Trot 5K is $30 and the Gobble Wobble is $25. Day of packet pickup for late registrants is 6:30 to 7:30 a.m. for the Gobble Wobble and 6:30 to 8 a.m. for the Turkey Trot. The Gobble Wobble kicks off at 8 a.m. Thanksgiving Day at the Centennial Valley Country Club fitness center (1555 Centennial Club Dr.) and the Turkey Trot kicks off at 8:30. The Turkey Trot 5K has become Conway’s Thanksgiving family tradition for many in the area. Participants are asked to bring nonperishable food items to donate to Bethlehem House, CAPCA, the Faulkner County Council on Aging, the Salvation Army and the Women’s Shelter. The race also benefits United Way of Central Arkansas funded partner programs, such as the Faulkner County Council on Aging Meals on Wheels program, the Milestones preschool program, the Faulkner County single-parent scholarship program, Bethlehem House’s transitional housing program and many more. The Turkey Trot keeps growing and growing! Let your business be part of this growth. United Way is seeking sponsors, who will have their logo on the event T-shirt and the chance to put a flyer/coupon in the runners’ bags. Businesses also will have the opportunity to publicize any Black Friday and/or Small Business Saturday sales/specials. 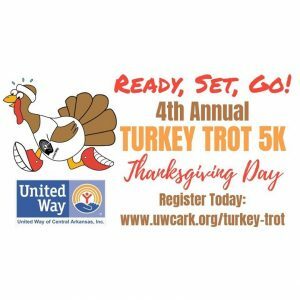 To sign up to be a sponsor for the Turkey Trot or Gobble Wobble, visit uwcark.org/turkey-trot-sponsorship and/or uwcark.org/gobble-wobble-sponsorship-information. For more information, contact Joanna Grana-Maciel at j.granamaciel@uwcark.org or 501.327.5087.